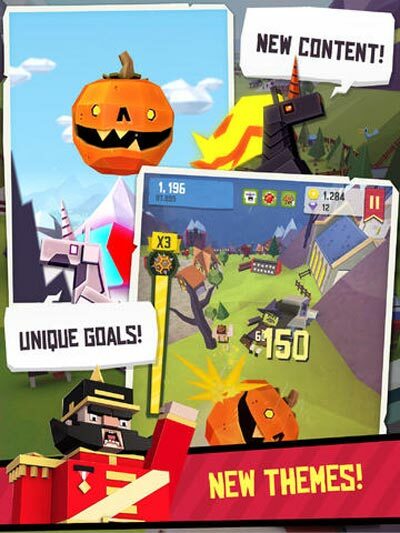 This game is presented in cheerful, yet sparing with polygons, 3D graphics, and is so easy to play that everyone can enjoy it since the very first round. 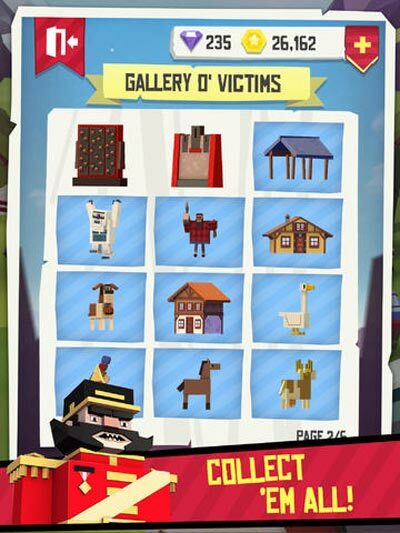 It's supported by optional in-app purchases, though they are not strictly needed at all. In the end, it's fun for fun's sake, and we love that. 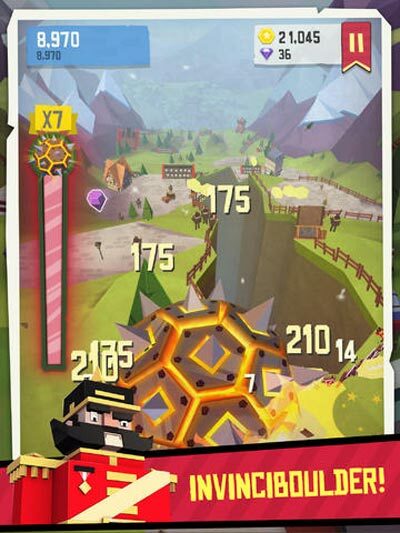 But despite its nice presentation, the repetitive gameplay and noticeable lack of any addictive incentives to keep you really coming back for more after your first few rolls down the idle mountain hillside really lessen the experience as a whole. I would still recommend it over trying to smash up some evergreen trees yourself in real life, but not if you’re in the market for a lasting endless runner experience. 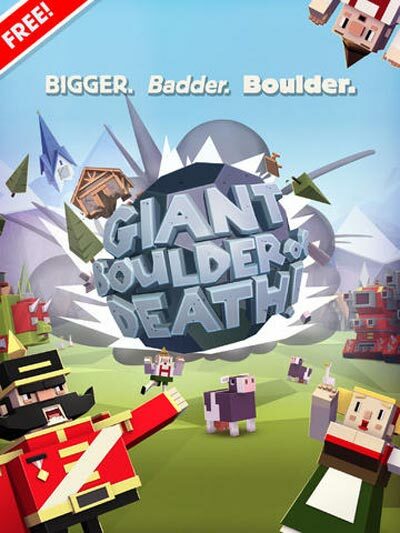 Giant Boulder of Death is generally very similar to that bright insanity, both in looks and in gameplay. Sound design is also surprisingly well done, and is among the few that I didn’t mute after five minutes of playing the game. So, wrapping up, Giant Boulder of Death is good. It’s mighty good. It’s so good, in fact, that I’m not really in the mood to right this review any longer, as there are still some hillbilly bastards that need squishing. Bye. 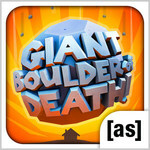 Giant Boulder of Death is a quintessential Adult Swim game. It's strange and silly, but also incredibly well balanced and designed underneath its anarchic surface. 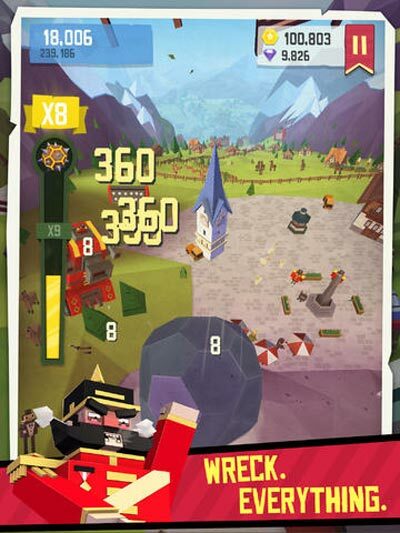 Most importantly, the feel of it is just right - impacts feel crunchy and the time spent as an invincible ball of destruction are wonderfully cathartic - while the game keeps adding more weirdness on top the longer you play. Rock on.